“The $VIX was up 2.08% today, NOT 18.5%” Mark Sebastian from Option Pit . I have to admit that my brain spun a bit on Jared’s percent of a percent observation. Yes, the VIX value is already a percentage—formally it’s an estimate of what volatility will be over the next 30 days that’s annualized to be a full year’s forecast. So if the VIX is at 11.38 then the forecast is that the S&P 500 will fluctuate within +/-11.38% over the next year. Just like a weather forecast, there’s also an estimate of how likely this forecast will be correct—in the case of the VIX it is always the same number—68%. The VIX jumped 2.06 points from a close of 11.38 on 15-March-2013 to 13.36 on the 16th—that’s an impressive 18.5% move. But the annualized forecast only changed to +/- 13.36%—not something to hyperventilate about. Percentages are useful for evaluating changes. If I say that XYZ stock is up 5 points it doesn’t mean much to the listener unless they know the starting point or basis. Is it a $10 stock, or a $505 stock? If I report XYZ’s increase as a percentage (e.g., 100% or 1%) I present a clearer picture. The VIX index is not like a normal stock—it won’t go to zero, and it tends to drift or revert towards a middling value (median of 19.05). The chart below shows the 5847 VIX closing values between 2-Jan-1990 and 20-Mar-2013 summed in 0.1 wide bins between 5 and 85. What an ugly distribution! Don’t try to use your typical statistical tools (e.g., mean, standard deviation) on this beast! 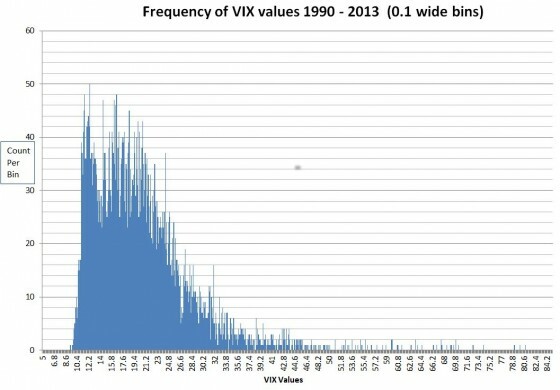 In the last 13 years the VIX has dropped as low as 9.3 only once, but it has closed between 11.1 and 11.2 thirty-nine times. During that time span it has only closed over 50 fifty-six times (0.96%). Are the recent big percentage moves an indication of high market fear or is it more likely due to the VIX recently revisiting 5-year lows? 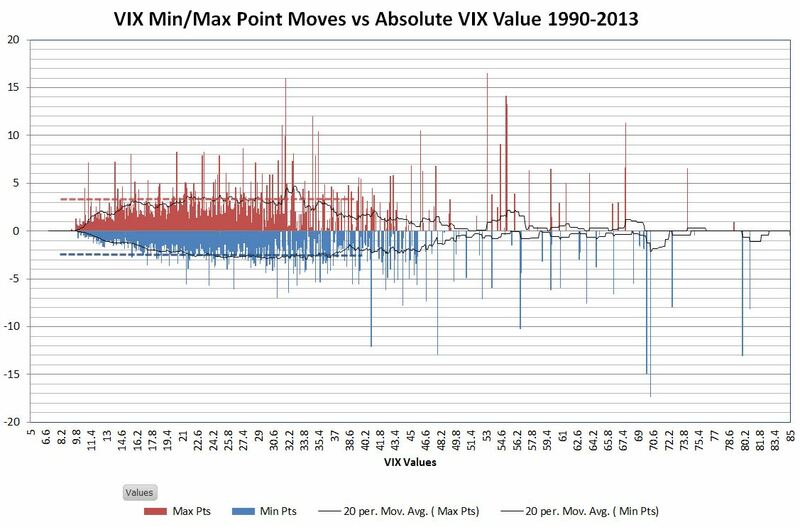 With low values of the VIX a big percentage jump only requires a relatively small point move (e.g., A 3 point increase on a 10 point basis is +30%). Pursuing that question I plotted the maximum positive and negative percentage daily swings in the VIX against the VIX value itself. 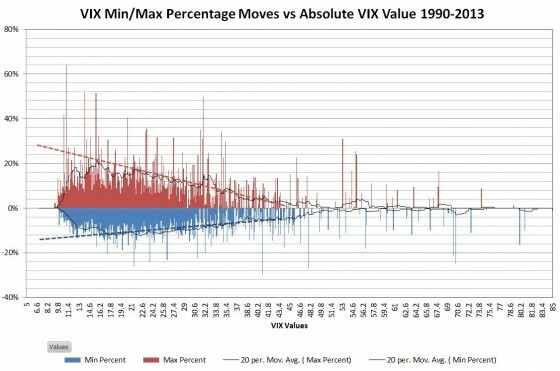 Not surprisingly the min/ max percentage moves do increase as the VIX level decreases. The next chart shows the min / max point moves (not percentage) in the VIX. 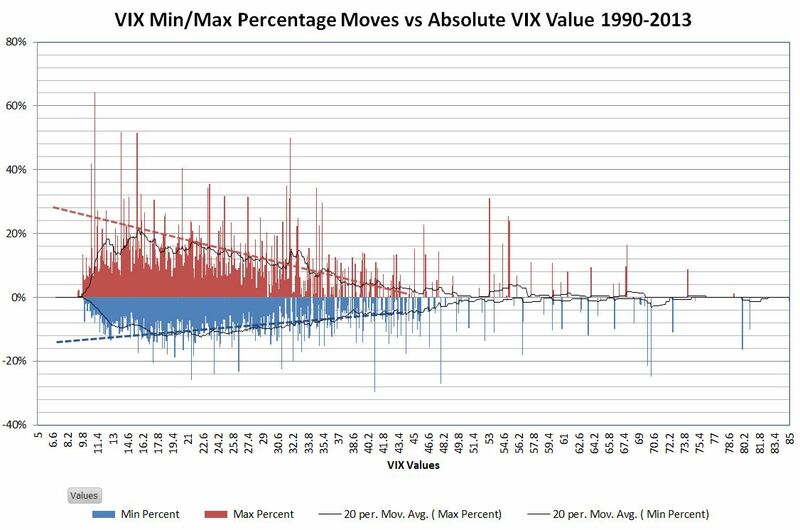 VIX values between 10 and 40 tend to have maximum moves in the +3 / -2.5 range, it doesn’t seem to matter much what the starting value of the VIX is. Bottom line, history suggests that unless the VIX moves more than +/- 3 points nothing particularly noteworthy is happening. On the other hand, if you are trading in VIX futures or volatility exchange traded products like VXX, UVXY, TVIX, or XIV (full list) you do care about VIX percentages. Big VIX percentage moves usually aren’t matched by these products, but the leveraged products (UVXY, TVIX) often do a respectable job of tracking the big short term VIX moves.